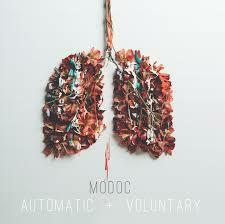 ALBUM REVIEW: MODOC, "Automatic + Voluntary"
The opening guitar attack of Modoc’s new album, Automatic + Voluntary, wakes you up like a splash of ice cold water – sounding like Mission Of Burma, then spinning into a perfectly executed glam-styled chorus. So that bodes well for the sophomore effort for this band who originally hail from Muncie, Indiana but have since relocated to Nashville. Catchy, taut, driving and powerful – there’s very little room to catch your breath; this is all a very good thing. What’s more is that this full-bodied aural assault is coming from a three-piece, but they make it sound fuller and fatter. Chops, well-crafted songs and harmonies are certainly the order of the day here. As I said, the first warning shots come straight from “Black Eyed Lover”, which is an inspired choice for the album opener; “Kids On The Run” starts off with a descending guitar figure which sounds oddly like The Beau Brummels’ “They’ll Make You Cry” but then picks up intensity and throttle and “Always The Same”, while a slightly slower tempo is tense and crisp and uses a very subtle and tasteful synthesizer “wave” underneath the guitars. “Told You So” is about as perfect a power-pop track, styled in the ’70’s, complete with roller-rink organ, a memorable riff and handclaps and “Out Of The Blue” is a percussion-fueled magnum opus with some stellar backing harmonies. Ten songs that will keep you paying attention and then playing on “repeat”. Yes, this album should be automatic and voluntary – voluntarily listened to over and over again.